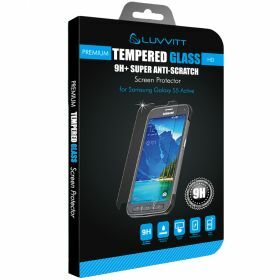 Protect the screen of your Samsung Galaxy S5 ACTIVE with this premium quality Japanese Asahi glass by LUVVITT. While regular glass hardness level is 5.5, this ultra high clarity screen protector features a 9H+ hardness which is very close to the hardest element on earth (diamond with 10 hardness) and it's almost impossible to scratch. At 0.33mm, this premium glass has optimum thickness/slimness to provide enough protection for your phone while providing the bare screen sensitivity so you won't even realize it's there.